A Beautiful Tribute to a Wonderful ManFor several months, I have been eagerly awaiting this book about my hero, Janusz Korczak; the colorful thumbnail picture and the projected release date were teasers all summer long. The book was released on schedule and I immediately bought a copy. Well, both the wait and the purchase have been most worthwhile.So, another book on Korczak for children? I already have several fine volumes, including those of Spielman, Adler, and Bernheim, along with a rare imprint from Israel. First, with so little about this great man published in English, anything of quality is welcome. Second, Korczak was a true champion of children, so children's books about the Old Doctor are particularly welcome. Of the three picture books on Korczak currently available, this one is my favorite.Janusz Korczak was the pen name of Henryk Goldzmit, a sensitive boy born in Warsaw in 1878. A loner and a dreamer, from the time he was about 11 he empathized with the children in the street, most of whom were much poorer than he. When his father died, the young Korczak had to take on tutoring jobs to support his family; even then, he offered lessons for free to pupils who could not afford the fee. He went on to study pediatric medicine, but gave up a lucrative practice to found an orphanage. He incorporated his ideas, all of which were based on the respect for the child, who he considered a person here an not, not a person of tomorrow. With the Nazi invasion of Poland in the Second World War, Korczak and his staff were forced to relocate to the infamous Warsaw Ghetto. On several occasions, he was offered false papers to escape to the Aryan side. However, he refused each time, continuing to provide comfort for the many orphans in the city. Several writers have described his somber procession of nearly 200 orphans to the trains that would take him and his charges to Treblinka, never to be seen again.Books and plays on Korczak fall into two categories: telling his entire life or focusing on his role in caring for children in the Ghetto. This book falls into the former category, providing the reader with an important context for Korczak's heroic deeds without making him appear a victim. Tomek Bogacki, himself born in Poland but now living in New York, tells of Janusz Korczak's life with great sensitivity, without sentimentality; his beautiful acrylic illustrations complement the text effectively, especially in his use of bright colors to illustrate the happy moments and dark, somber colors for the sad parts of the story. The text may be a little difficult to read for younger readers, but the book is suitable for read-aloud even for little ones - even in the darkest moments, there is hope. Which is exactly how Janusz Korczak, champion of the children, wanted it. Will kids pick it up? Probably not! Will teachers and librarians love it? Highly likely.It inspired me to research Janusz Korczak. This is the second picture book I have been able to find on Janusz Korczak, and of the two it is the most informative. Korczak was a Jewish doctor, writer, children’s advocate and humanitarian; reading about him is extremely humbling. He was a pillar of strength and comfort for many orphans in Poland before and during World War II. Sadly, his and his children’s lives ended in the Treblinka extermination camp. His life and sacrifice is one that should never be forgotten. Parents and educators must share his story with their children when covering the Holocaust. Folklorish pictures have a Chagall look. The story seems to skimp a bit. Wanted more. For someone that I'd never heard of, he certainly seems like someone who is deserving of our attention. Like a Polish version of Jane Addams, he spent his life caring for the poor, creating a place where orphans could go and get an honest chance at a better life. The tragedy of it all is how terribly WWII effected his impact on those orphans he set out to help. I don't think it's overstating his goodness to call his actions heroic. Though a victim of the Holocaust, he left behind a legacy that we could all aspire to emulate. Incredible story that I am so glad the author shared with the world. BIOGRAPHY. “The Champion of Children, The Story of Janusz Korczak,” written by Tomek Bogacki, was a wonderful read. I chose to read this book because I had never heard of Janusz Korczak before and I wanted to learn about somebody new. I am so glad I chose this book because I enjoyed reading about this man’s incredible life devoted to children.Even as a child, Janusz Korczak had a heart burdened for helping children. He would walk up and down the streets of Poland and see poor children everywhere that he wished he could help. In fact, he even dreamed about what he would do for these children if he were a king. When he was 11 years old, his dad grew sick and he had to tutor other children to help support his family. In addition, his father died 7 years later. Although this was very hard for Janusz, he realized there were people who had it much worse. This is the part of the biography that really stood out to me because I was so encouraged by the maturity of such a young boy. I would use this part of the book as a teaching moment for children about how life-circumstances can be awful and hard, but you should still be grateful for what you do have. The end of the book documents how Janusz grew up to be a doctor who loved children and did everything in his power to help them. He even opened an orphanage for Jewish children that had a dramatic positive impact on their lives. The end of the book is both sad and encouraging, but I’ll let you read to find out what happens.I would definitely encourage teachers to use this book in their classrooms. This biography would be great for a read-aloud and it could be used to teach many things. For one, it involves dreams, passion, compassion, selflessness and courage. In addition, it has a lot of historical context and even involves the Holocaust. Although some of the names and places in this book are hard to pronounce, I think it would be a good learning opportunity to look up the pronunciation and show students that you stumble over words sometimes too. This book also provides information about a diverse culture, which is something all students should be exposed to. I think this biography is a great read for grades 3-5. It's very difficult to simplify complicated true stories in a format that is accessible to children, without stripping away the heart of the person being portrayed. This books makes that attempt in regards to Janusz Korczak, a remarkable Jew from Poland who grew up in a comfortable household but keenly felt the struggles of the poor. He dedicated his life to helping children, first studying medicine, then working in a hospital for Jewish children, then learning everything he could about orphanages so that he would be able to establish his own model orphanage that promoted education and children's rights. His ideas really were remarkable: the children had a parliament that established the rules that everyone, including the staff, lived by. There was a children's court, a weekly newspaper, a mentorship system for new arrivals, summer camp. Then WWII came. Germany invaded Poland and the Nazis relocated all of the Jews into a walled ghetto. Even though Korczak was internationally know and could have gotten out, he refused to leave the children under his care. And when the children were marched off to Treblinka, Korzczak went with them, keeping them calm and dying with them. It's a powerful story, though the presentation here may be too dry/intense for kids.The book describes all of this very directly; while it may not capture Korczak's heart, the book certainly can serve as a starting point for in-depth conversations on the many topics raised by his life story. An adult reader will be left wanting much more and for them I highly recommend the amazing When I Am Little Again and The Child's Right to Respect by the man himself, which is an enlightening and humbling read. It is a travesty that that book is out of print. I totally agree with Heidi Estrin, the reviewer of this book for the School Library Journal. As posted on Amazon.com:Grade 4–7--Korczak was a doctor, writer, and advocate for children's rights in pre-World War II Poland. He ran an orphanage for Jewish children and acted as a beloved father figure right up until he and the children perished together in Treblinka. Bogacki's picture-book biography is heartfelt and well researched. However, it seems overwhelmed by its own subject, as the author condenses the details of Korczak's upbringing and the context of the Holocaust into a backdrop for the story of the orphanage. As a result, Korczak doesn't come across as the fascinating man he was, and the book is a bit confusing. Bogacki's childlike illustrations seem wrong for the dark subject matter and dark scenes, particularly since most children don't learn about the Holocaust until fifth grade, and these pictures seem too young for that audience.--Heidi Estrin, Feldman Children's Library at Congregation B'nai Israel, Boca Raton, FL Copyright © Reed Business Information, a division of Reed Elsevier Inc.I wish to thank Estrin for articulating what I thought: Bogacki's text is too dense for an adult reader (me) to go through it (a children's book) as easily as I expected. The illustrations are beautiful, though. The story of Janusz Korezak has been documented in many sources. This picture book reveals part of his story to a more youthful audience. The length of the text and the content would be better suited for children slightly older than the usual picture book audience. Janusz's love of children will be felt immediately. The illustration on the cover page aptly illustrates this point. How many grown men are hugged by a half of a dozen children?Non-fiction books that focus on prominent individuals introduce the concept of a "biography" to younger readers. Tomek does a wonderful job of bringing Janusz's life into the spotlight by using a combination of pictures and words. It is one of many books that can be used to highlight the beginning, middle and end of a prominent person's life and the choices that they made. The ramifications of the Holocaust are addressed in the last half of the book. All of the information provided will be useful to any upper elementary child or middle schooler who is trying to gain an understanding of World War II and the Holocaust.Learning that Janusz perished with his orphans instead of responding to multiple opportunities to escape, illustrates the full depth of Janusz dedication to the children who he cherished. This book is different from other children's books I've read. Most I've picked up to read to my kids are more fluffy and have a lighter subject. If you want to protect your kids from the harsher aspects of reality then you should pass this book. Spoilers: (if you care)It is a biography about a man who ran an orphanage during WWII. The orphanage had some really innovative aspects. It also happened to be for Jewish children. There is no Hollywood ending for Mr. Korczak or his children.I had an idea of how this book would end due to my knowledge of history. My kids are quite young and I chose to read it to them anyway, mainly because I was interested in it. It went over their heads but I've made a note of it because I intend to revisit it when they are older and can understand it better. I don't believe in artificially shielding children from reality. Children are smarter and stronger than many adults give them credit for. That said, I would not read this to other children without making sure the parents were okay with it. It is heavy material and there is no one age that every child is ready to process it. This is the story, as the title suggests, of Janusz Korczak. Korczak grew up in Warsaw, dominated by tsarist Russia, and dreamed of creating a better world for the suffering children around him. He became a famous doctor, writer, and children’s advocate. He created an exceptional orphanage for the Jewish children of Warsaw. The book ends when, after being forced to move the orphanage into the Warsaw Ghetto after Hitler’s rise, Korczak died. While the story itself is interesting, the text is a bit overwhelming for a picture book. It comes across almost as a portion of a history book put into a small format with the addition of pictures. The drawings themselves are somewhat amateur and don’t really draw the reader in where the text might lose them. The subject matter is somewhat dark and the ending not very hopeful, which readers at the intended audience might not like. It’s suggested for grades four through seven, but I’m not really sure they would like it unless it was condensed in some way. 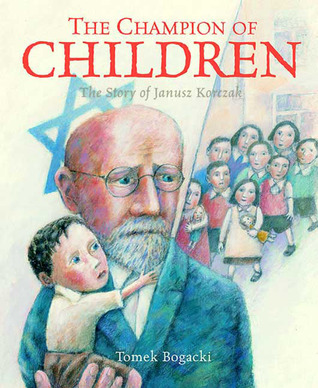 The Champion of Children: The Story of Janusz Korczak is a biography book. This book received the National Jewish Book Award Finalist. The book is intended for ages 6 through 10 years old and grade range from 1st through 5th. This age would cover the (P) Primary age range, from 5 through 8 years and also the (I) Intermediate age range, 8 through 12 years. This book tells the life of a Jewish doctor who took care of children and was a well to do man. He thought the remember how to survive the camp they were in, in Poland. He went with them as they were being eliminated by the hands of Hitler's Nazi troops.The book was delightful in learning about someone I had never heard of before this reading. That is why I gave the book a 4 star rating. The book presented itself well in the theme, color and illustration. This book I believe would be appealing to the young reader within these two different age ranges. I would use this book to bring insight to my students about a person they may have never heard of . The book was read and reviewed in November 2013. This book tells the story of Janusz Korczak. The cover would imply his work with children during the Holocaust, however more of the book focuses on his development. He starts out a young boy who loved to give and cared about others. The story shows life in Warsaw, particularly the Old Town where the poorest children lived, and the mistreatment of the people within. His father became ill and died, which led Janusz to become a doctor, eventually running orphanages, where he helped children learn, grow, and have fun. It briefly mentions his writing King Matt the First, a book about children for adults. It briefly talks about the Holocaust, orphanages and how he continued to care for the children in the ghetto, writing Ghetto Diary. The story ends with Korczak leading his orphans to the concentration camps. His compassion for children is the primary focus/highlight of the book, less so is the Holocaust. Tells the inspiring story of Janusz Korzcak and his determination to help the children of his community even in the face of unspeakable evil. Dr. Korzcak always helped the even the most under appreciated children of the world were special, and created an extraordinary orphanage for the Jewish children of Poland in 1912. His unique take with children encouraged self-governance and responsibility, while foster a drive education and self-improvement. His love of children and ability to change his community would be inspiring in it’s own right, but his refusal to leave his children in the Warsaw Ghetto is the moving part of his life’s story. He sacrificed his life to his passion, and help to teach children of all ages that that every one is special, and education is always the key to achievement, and most of all to stand up for your community in the face of persecution. Janusz Korczak was a dedicated doctor, orphanage director, children’s author, and pioneer of children’s rights. He led an amazingly influential life before he was killed, along with the children from his orphanage, in a Nazi concentration camp. Bogacki pays homage to this inspiring man through his soft mixed-media illustrations that perfectly portray the text. Children will enjoy finding tiny details in the full-page and smaller inset pictures. Fully cited with sources and a historical note, this book would be a fine addition to an early-twentieth-century or foreign perspectives program, but would be better received after a fuller understanding of the atrocities of the Holocaust has been established. If your library has any of Korczak’s children’s books, this story of the author’s life would be an excellent addition to your collection. I agree that this is a picture book that teachers and librarians will love. I thought the pastel illustrations were engaging--a bit comic-like, and inconsistent. The background story of the author was most insightful. Korczak was ahead of his time in his fight for human rights to extend to children. His respect for their opinions and interests makes me want to read his works to gain more insight into democratic education. It's hard to imagine a more complex, compelling, inspiring life, or one that should be more widely known and celebrated. The author/illustrator has managed to make a privileged boy living more than a century ago in a very foreign place come to life. This is the ultimate story of how one life can have an impact on the world, in his own time and ever after. This, to me, is a reality check for those who define success as getting a million "likes" on Facebook. This book is currently being considered for a slew of awards. While I think the book has its' merits, I found the writing style to be dry and might prove to be boring to everyone but the most experienced of my own student readers. I, myself, love history. Korczak's life story made me want to read more on my own. But will my students feel the same way? Probably not. The illustrations of Warsaw before the war and after made a quiet statement at the beginning and the end of book. This book was my first introduction to Janusz Korczak, and I immediately wanted to learn more about him. The writing is straightforward, and the illustrations seem to fit the subject nicely. I wonder how children will react to the abruptly sad ending. A really lovely and touching biography of a man who dedicated his life to improving the treatment and education of children. I'd never heard of him, but I think this would make an amazing book to study as a class -- and then implement his ideas together. Wow what a wonderful and touching book. This is the story of Janusz Korczak, who in Euorpe is just as famous as Anne Frank. This such a touching story of one man and the legacy he has left behind for all of us. Sad biography. Pictures are very moving. Grades 3-5. Sounds like a book that should be in every library, school, etc..